A powerful architectural impression was achieved through the simple, repeating and discretely expressed façade modules, generated by the north lights. The skylights provide generously day-lit spaces throughout the complex, and continuous strips of glass along the ground floor allow the buildings to float, further humanising the scale of the spaces while providing views out to the landscaped surroundings. Columns were designed assuming some rotational fixity to minimise second-order effects. This was derived from a study of potential settlement of the pads, and considering the need for them to stand without temporary works during erection. Wind behaviour on saw-tooth roofs is directional relative to the saw-tooth, but large-scale roofs behave differently to small-scale roofs. So, comparing the peak wind effects from the roof geometry with peak wind directions for the site, sheltering benefits and size factors, the uplift loads were reduced by up to 70% for most of the roof. 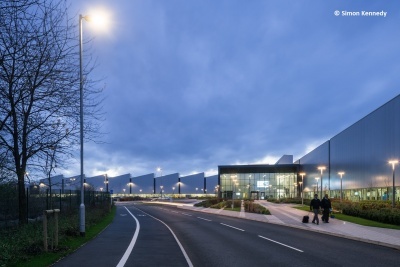 Jaguar Land Rover’s commitment to sustainable, low-carbon, manufacturing was supported by Arup’s ability to provide integrated and innovative low-energy design solutions, resulting in one of the largest buildings to achieve BREEAM ‘Excellent’. 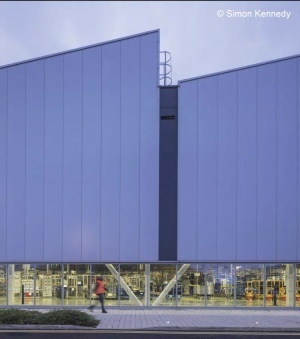 Sustainable measures include the UK’s largest PV installation, zero operational waste, extensive grey water recycling, day-lit spaces, naturally-ventilated offices and a pioneering 'solar cladding' façade system. The north lights’ vents open to expel hot air in summer reducing extract energy. Responsive dimming controls for the lighting system helps to capitalise on the generous daylighting in the space to save further energy. 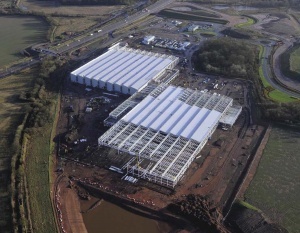 Main Contractor Interserve Construction Ltd. Drawing on traditional industrial forms, the team has updated these principles to deliver a stunning workplace to train and attract the best talent in the industry. The lightness of the framing, extensive roof‐lights and perimeter windows deliver high levels of natural light. The steel is efficiently designed for current operations and adaptation for changes in engine design and technology.